Undeterred by weather warnings and life-threatening conditions, a US storm chaser managed to capture the moment a single Colorado thunderstorm spawned two tornadoes. The result is breathtaking, showing nature at its most awe-inspiring and mysterious. The image, snapped by storm chaser and weather photographer Kelly Delay, shows two tornadoes touching down near Simla, Colorado, at the same time on June 4. The rare event was the result of a supercell thunderstorm – a powerful storm characterized by a deep, rotating updraft known as a mesocyclone. The impressive supercell was dubbed the “storm of a lifetime” by Kelly. Another photo on Twitter showed the same storm kicking up dust in the Colorado plains. The color has been enhanced, showing the difference between the funnel cloud – which is very light– and the dirt and debris it is churning. According to Delay and other storm chasers, the supercell produced at least four tornadoes– at least one of which damaged several homes, Mashable reported. 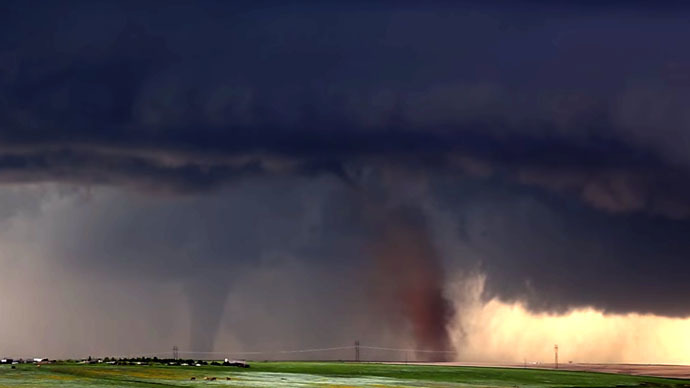 It is, however, possible that the photo is showing one tornado on the right, and one landspout funnel on the left – rather than two full-blown twisters. Also known as"dust tube tornadoes," landspouts are twisters that are not caused by the rotation of a supercell. These tornadoes typically form underneath thunderstorms, and are comparatively weaker. At least five homes were damaged in Simla, a small town located about 60 miles southeast of Denver, according to the Elbert County officials. Three homes were also destroyed and more than a dozen damaged in nearby Boulder and Larimer counties.Heavy hail fell in the area during the intense storm, causing damage to vehicles. Colorado, which typically boasts of having "300 days of sunshine a year," has experienced an unusual dose of severe weather over the past week. According to the National Weather Service, the spell of tornadoes and thunderstorms was caused by the combination of hot weather and low-level moisture. More storms are predicted this week. Although considered rare, twin tornadoes have been captured in the past. Nearly a year ago, twin twisters hit the Nebraska town of Pilger, killing two people and injuring nearly two dozen.